Having a guide on your journey to self-improvement is great, but the powers that be don't always hand you a great fit, whether it's the gym sticking you with a 'roided up psycho, or...oh, you're here already...guess it's time to work out. 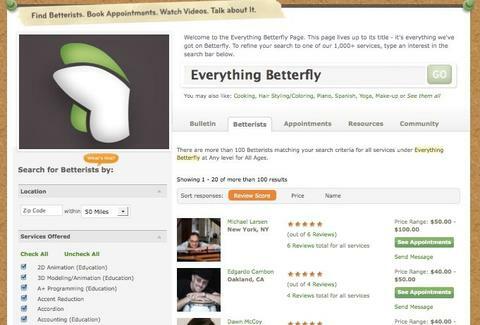 Helping you find the right guru for you: Betterfly. Founded by an NYer tired of working towards self-improvement with incompatible tutors, BFly's a human-to-human network connecting individual trainers in hundreds of areas with the rubes motivated go-getters who want to "learn, look and feel better". To start your hunt, you can either supply your zip code to comb through local "betterists", who can help you with everything from drum lessons to physical training, or browse through 1000+ categories and add the areas you'd like assistance in to your home page, whether that be cooking, web design, competitive eating, or glassblowing, so you can finally make that, uh, vase. Because it's less about "the best" and more about "the best fit", a community-driven five-star rating system is abetted by more in-depth reviews from verified clients, who have the option of posting anonymously should their martial arts coach only be terrible at the teaching half of Karate. If a peer is what you need, there's also an option allowing you to search the exact same categories for/offer yourself as an "activity partner", in case your journey to self-improvement ends the moment you find someone worse than you.